Ghee Rice/Neichoru | Simple and Delicious ! 1)Soak rice in water for 30 mins. 2)Heat ghee in a heavy bottomed vessel. 4)After a few seconds, add onion and stir, till, it turns transparent. 5)Add cinnamon, cloves and cardamom and stir. 6)Add 2 cups of water. 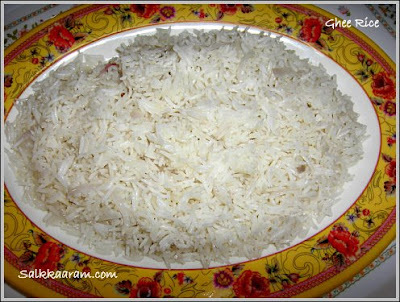 :- For 1 cup of rice, add 2 cups of water. 7)Add enough salt and mix well. 9)Add washed rice and let it boil. 10)Cover and cook on a low flame. 11)When there is no water, remove and keep the lid closed, until rice is cooked well. :- Serve with parippu (dal) curry , chicken or mutton curry, pickle and curd. Kozhi varutharacha curry/ chicken curry in fried coconut gravy with potatoes is the curry usually prepares with Neichor. 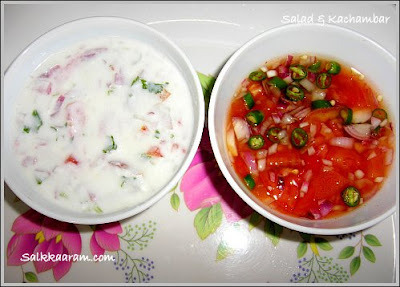 Kachambar - Chop 1 medium size onion, tomato and green chilly. Add 1/2 tea spoon chilly powder and 1 table spoon vinegar into it. Add 2 table spoons of water and enough salt. Mix well. Wow!!! the recipe looks so yum. this reminds me of a time when a friend's mother took over my kitchen and converted my rice into 'neyychor'. I had never made neyychor till then. I have to check rest of the recipes on your blog. Will come back. nice recipe... thanks seena...happy easter. A delicious looking spread!I love neichor too! Thanks for visiting my site..
Reena, it is very easy to make neichor. Try it again. Thanks for the nice recipe Seena.I made neychor with kozhi varutharacha curry yday..It was really good..and tasty.. I have a doubt.The neychor which i made was slight yellowish in colour..is it because of the ghee used? The rice which we get in hotels is white in colour ,still they have lot of ghee in them..can u explain? It may be due to the color of ghee as you said. Which brand of ghee you use? Okies Seena,lemme try with vegetable ghee as u said the next time, and surely let u know the result..thanks a lot..:) no am not in UAE,am in singapore .. There is a method by draining the water and adding the ghee later. Does any body knows about this? 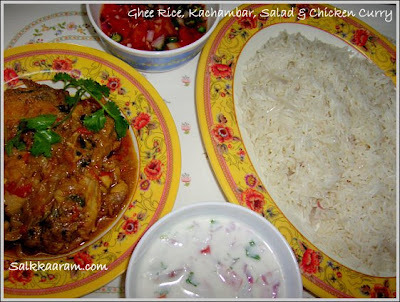 Hi Seena ... Am gng 2 try this as i made ur easy butter chicken & was really delicious! Didnt knw i could make it so ea..sily. Hav bookmarked. Keep up the gud wrk. I have tried this biriyani today and must say it was yummmm!! Compared to other kerala biriyani recipes this was by far the easiest and i was reminded of biriyani served in nikahs! Keep posting recipes like this and keep up your efforts in making people like me miss kerala cuisine ;) Well done! Hi Seena, it looks very yummy. But whenever i try kerala foods, i am not getting the exact taste of yours..